Today I would like to introduce you to a company that has been in business since 1535 and is called RJ Balson & Son, or better known as Balson Butchers. This particular company specializes in English and Irish speciality meats. When you shop for your specialty meats at RJ Balson, you will find delicious selections like Traditional Pork Banger, Pork Back Bacon, Breakfast Bangers, Garlic & Herb Banger and Tomato & Basil Banger. Our Foodie Review: The company sent us 3 different foodie products to try out for all of you. First up, the Pork Back Bacon which was absolutely delicious! This product is sold in 1 lb. packages (2 packages that each have a 1/2 lb. in them). This pork back bacon is hand-trimmed and the pork loins are cures the traditional way, along with some subtle smoke from an applewood log fire. 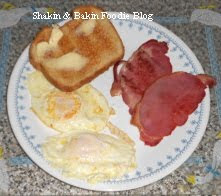 Hubby and I decided to use our Pork Back Bacon for breakfast one morning to go along with our over-easy dippy eggs and honey wheat toast. We took the slices out of the package and pan-fried them in a tad of oil for just a few minutes. You do not want to over-cook them at all. (They are fully cooked). Once done...we dug in! Oh my gosh, seriously folks, this is/was the BEST pork bacon we have ever had!!! We totally ate up that first pack and the very next day, breakfast again with the other pack they had sent to us! 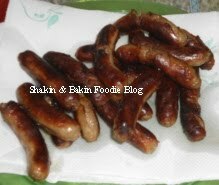 Next up is the Breakfast Bangers which we made a few days later along with the Traditional Pork Bangers. Oliver over at Balson Butchers was telling me about Bangers and Mash so hubby and I decided to invite a few friends over for dinner. We made both of the bangers along with mashed potatoes and buttered peas. 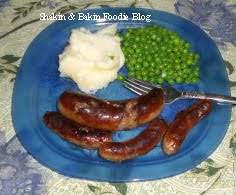 The traditonal Bangers & Mash meal also includes gravy, but we are not fond of gravy so we skipped the gravy portion of that! These bangers are done in the traditional English & Irish way and are made from pork. The natural casings contain pork that was beautiful seasoned with spices and bread crumbs. The Traditional Pork Bangers are much larger in size than the Breakfast Bangers but tasted identical. These specialty sausages are MSG and Nitrite free. They are fully cooked, just brown and serve. Oliver advised us to really "brown" up these babies so we spent a total of 7 minutes browning them up to perfection. He recommends that you make them nice and crispy which we did! Once done, I served the bangers, mashed potatoes, buttered peas and some homemade cornbread to my dinner guests. Everyone raved and raved about this meal! We all had a pig-out feast and when we were done, our tummy's were full! What a delicious and satisfying meal! There was absolutely NO leftovers, not even a crumb! These bangers (sausages) are seasoned to perfection! We highly recommend Balson Butchers to all of you! Trust me, you just can't go wrong with this company! Their meat products would be perfect this summer for when you are entertaining guests or having family cookouts.